In this picture you can see a home with some of the cheap plastic gutter covers that you can buy at Home Depot or Menards. They don’t screw into place and so often come loose or get blown out. There are sections missing. When a section is missing then the debris not only gets into the gutter but also gets trapped under the existing gutter covers. 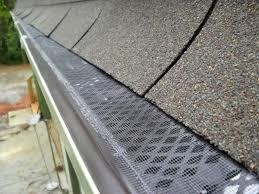 The pieces often sag and debris gets in where two pieces of gutter cover meet. Sometimes we see the plastic screen separate from the plastic frame and then debris gets in there.